The pain I've been feeling in my lower ribs since I was diagnosed with the swine flu last week was getting to be too much to bear. What started as hurting when I took a deep breath, changed to hurting when I breathed at all. Last night it changed to just hurting...period. A chest x-ray today showed pneumonia. Just three days after finishing my Tamiflu, I am once again medicated; this time with an antibiotic. I'm trying not to watch the news, read the paper or, for crying out loud, surf the internet. So many of you have sent well wishes that I felt I should at least update you...and beg for more prayers. My son was put on an anti-viral last week as a precaution, but that didn't stop him from coming down with a sinus infection (which was likely a secondary bacterial infection following a mild flu...though we don't know for sure). He has been on antibiotics since Saturday and is feeling much better. My daughter has been fighting a sore throat and headache for about a week. She's seeing her doctor in the morning. My husband is totally fine. Lucky sucker. I appreciate your concern and prayers. Thanks to everyone who is wishing me well. I am a pig hater. Oh, I like bacon, ham and sausage and all...but, when I'm the sickest I have been in about seven years, and it's because some pig went and mutated the flu virus, then I have every right to hate pigs. I have H1N1, also known as swine flu. I did everything right. I got my seasonal flu shot the first week they were available and planned on getting the H1N1 vaccine. I wash my hands A LOT, I wipe off my shopping carts at the entrance to the grocery store, I use hand sanitizer as soon as I leave a place where I have touched anything and I never, ever use a drinking fountain. I am taking Tamiflu and have been resting and drinking lots of water for the last two days, but I am still fighting a fever, aches and a cough. I have asthma, so that coughing thing scares me quite a bit. I'm pretty concerned about my kids too. My daughter went to bed with a headache (which was one of my early symptoms) and my son is high risk because of his heart. Your prayers are appreciated. This blog is mostly light-hearted and I would like to keep it that way. I'm taking a break. I am really sick and if I wrote anything it would likely be a whole lot of complaining. Just ask my husband. Please send good thoughts our way. This virus is so not good for my anxiety issues. I do not sleep. 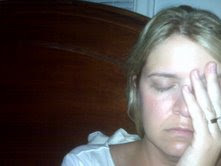 Chronic insomnia has plagued me since I was pregnant with my daughter some 11 years ago. I have tried everything short of an acupuncturist and I even have one of those lined up. St. John's Wort, Melatonin, anti-depressants and anti-anxiety meds have been ingested, relaxation techniques have been used and I have one of the most comfortable beds and pillows I have ever rested upon. For the most part my problem exists because I worry a lot. Sometimes it's not even the worrying, but rather the constant chatter in my brain. Keeping my cell phone next to my bed helps a little because I can jot notes into it in the middle of the night (using paper and pencil was pretty tough in the dark), but even that doesn't keep the stress of everyday life at bay. This weekend, we took a trip to my in-laws' house. They live in a small, southern Ohio town in a big, old house with gorgeous woodwork and a great front porch. One of those roomy porches, with a swing and everything. Sigh. They live across the street from an enormous park where my husband and I walked the dogs and let the kids play until they were so filthy I barely recognized them. We drank some beer, ate homemade food, played cards with the kids and watched football. At one point on Saturday, my body sunk into their comfortable couch and before I knew it, I woke myself up with my own snoring. Classy, right? Whatever. I don't even care. My in-laws had 11 kids, so they've learned to tune things out. I allowed myself to doze off and on the entire afternoon. That night, as I was checking e-mail, I fell asleep at the computer desk. I stayed that way, slumped over with my head on my arm, until my husband came to check on me for fear I had died. That's how much I don't sleep. My spouse saw me with my eyes closed and thought I had passed away. And, yesterday after church I told everyone I was going to lie down. I climbed the steps and tucked myself into bed...and I went to sleep. I napped, people! That simply doesn't happen. At my in-laws' there is no agenda, no laundry, no meetings and no work. My kids can play freely without me looking at my watch so we can hurry off to the next thing on our schedule. I have always said I would dislike living outside the city, because I would be too bored. There just wouldn't be enough to do. Apparently I've been wrong all this time, because not having enough to do was exactly what I needed. My son's teacher pulled me aside this afternoon and said, "I'd like to tell you a story...in private." I'm not going to lie. I have been pulled aside by his teachers before. There was the time in preschool when he pretended he was at a party and the playground mulch was his confetti. And, who can forget the time he followed the principal around like a mime? Not me. So, today was nothing new. My son's teacher sent him down the hall to put some things away, then she turned to me and said, "The other day, I looked down to see your boy's hand in the front pocket of my pants." I put my hand on my forehead and began to shake my head from side to side. She continued, "I told him that he couldn't do that and I thought that was the end of it." My eyes opened wide in disbelief. "It wasn't the end of it?" "No, it wasn't the end of it, because later that day I reached in my pocket for something and pulled out his dirty tissue." And then she started cracking up. Thank you, God, for making my son use a tissue in the first place and thank you even more for a first grade teacher with a sense of humor. This article has suggestions for buying jeans for women with curvy figures. Um...really, Women's Health magazine? Because the only curve I see is that bended knee. If you haven't read between the lines you may not be aware that the name of this blog is a bizarre take on "Mom of Ali". Years ago when I created an online account and gave myself the user name of "momofali", my best friend sent me an e-mail asking, "Who's Momo Fali?" Since then, or at least since the creation of this blog, I often go by the nickname, "Momo". As far as nicknames go, this is significantly better than when my elementary school classmates called me "Dog-Star Diane". But, even though I am Momo Fali, I am Mom of Ali as well. And, that Ali? Is one heck of a kid. I talk a lot about my son's struggles, but his older sister was even smaller than him when she was born. Ali arrived 10 weeks early, weighing just 2 pounds, 9 ounces. That was almost 11 years ago. Considering where she started, she has faced a fair amount of obstacles herself. Her biggest challenge is being the sister of a kid with medical problems. It is not easy. At all. There have been times when she was promised a day of fun and she's ended up sitting in the emergency room because her brother was sick. There have been mornings when we had to drop her off at a neighbor's house at the crack of dawn so we could get him to the outpatient center for an early surgery. And, there have been countless meals when she's watched her brother choke and vomit at the dining room table. Needles, meds, doctors, surgeries, therapy, x-rays...these things are a part of her life just as much as they are part of ours. Knowing what she does about life at the ripe old age of ten, just doesn't seem right. Don't get me wrong. She's still a pretty typical kid. She bosses her little brother around, she talks back a lot and I've actually seen her spit her dinner into her napkin and then feed it to the dogs. Though, truth be told, I've wanted to do that myself a few times. Despite the things she has seen, or possibly because of them, she is amazingly well-adjusted. She is smart, responsible, kind and compassionate. I am lucky to have her. It is time that I told her so. Just like the letter I wrote to my favorite teacher last week, I am hoping she reads this so she can know how great I think she is. Maybe, just maybe, it will actually get her to clean her room. I feel like I should get something out in the open. I want you to get a true feel for who I am and you can't do that unless you know there is something I despise with my entire being. I always tell my children never to use the word hate, unless we're talking about this. This thing. This thing that makes me want to stay in bed, tucked safely under my blankets, this thing that makes me never want to leave my house and makes me want to, literally, run away to the other side of the country just so I can get away from it. This thing is winter. I know there are a lot of people who enjoy the change of seasons and blah, blah, blah, but if you're trying to sell me on the upside to a visit from Jack Frost, you can save your breath. Jack Frost can bite me. And, you know that snowman? He's not called abominable for nothing. There is the cold, slushy-muddy mess, the illnesses which rear their ugly heads and the not being able to walk out the door without everyone putting on socks, shoes, hats, coats and gloves. There are no barbeques in winter. There is no reason to say, "A cold beer sounds great right now". There are no lazy days at the pool, or drawing chalk butterflies on the driveway. There are no bike rides, no camping, no catching lightning bugs. Winter is cold and boring and LOOOOOOONG. And, right now all I can think about is how many days are left until spring. So, if you live in Arizona and don't mind a house guest...drop me a line. Please. I'll bring the cold beer. I have thought about writing this letter so many times. Hundreds of times, in fact. However, something always comes up. Life got in the way of me doing something I should have done 20 years ago. It is long past time that I thanked you for being a great teacher. It is hard to believe it has been more than two decades since I was a junior in high school and sat in your American Studies class. My mom and step-father has just gotten divorced, I was working long hours after school and staying up late to do homework. My life was in turmoil and by the time I sat down in your class in the late afternoon, I was exhausted. I remember falling asleep at my desk almost every day. I was struggling. My other teachers didn't notice; or didn't care to. You did. One day, you returned one of my papers with a hand-written note...I know you're going through a rough time, but college is not that far away and you need to start thinking about your future. I know you comprehend what I'm saying. You're smart and you write well. Don't blow it. Knowing that someone cared and that someone believed in me, at that point in time, was life-altering; possibly life-saving. Thank you for that. I knew that if I really needed to reach out to someone, you would be there. Thank you for your knowledge and your kindness. Thank you for teaching me the beauty of the written word, for sharing your faith and for reaching out to a slacking student. I was in the kitchen the other day when my seven year old son yelled to me from the living room, "Hey, Mom! Can I watch Cars?" I replied, "No, you watched it on Sunday and again on Monday. Why don't you read a book instead?" And, apparently he didn't like my response because then he yelled, "Ugh! Don't answer my questions ever again!" My seven year old son was playing around at bedtime recently, when I heard my husband yell up to him, "Quit goofing off and go night-night!" I stopped what I was doing and took note of the moment, because I was certain that my husband hadn't said, "night-night" in years and that it would likely be the last time he uttered those words with one of our kids. I suddenly wondered; when did we stop saying that? Words like night-night, binky and blankie are now but distant memories. When did my son stop calling me, "Mama" and start calling me "Mommy"? When did my daughter stop calling me "Mommy" and start calling me "Mom"? And, when did she stop calling me "Mom" and start calling me "Hmmph" with an accompanying eye-roll? These moments fly by, as much of life does, without us even taking notice. I, for one, am too busy cleaning the kitchen or picking up dirty socks to document anything but the big stuff. I have photos of pre-school graduations and videos of talent shows. I have programs from Christmas plays and boxes full of artwork but, how are you supposed to note the last time your child referred to the dog as a "doggie"? Hearing my husband call up to our son made me aware that those moments had passed us by. One minute my daughter was eating jars of food she called "num-num" and the next she's bringing home division-of-decimals-by-whole-numbers homework. And if there's anything that makes you wish your kids were still saying things like "night-night", it's that.